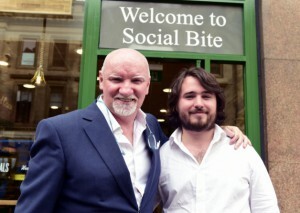 The Hunter Foundation, Sir Tom Hunter’s philanthropy, is investing £200k in Social Bite, an innovative social enterprise delivering high quality sandwich shops and corporate catering. The pioneering sandwich shop chain offers employment to homeless people and donates 100% of its profits to charity. This funding, and new debt finance support from Social Investment Scotland, has enabled the opening of their fourth store in Bothwell Street, Glasgow with a number more in the pipeline. Other stores are currently located on Rose St and Shandwick Place in Edinburgh and St Vincent Street, Glasgow. Social Bite, the sandwich shop chain that competes with Pret a Manger, Greggs and Subway, commits to employing at least 1 in 4 of their team from backgrounds of homelessness. The firm now employs over 30 people and 12 of those have struggled with homelessness. The new Bothwell St Branch will see newest recruit Brian land a job serving the busy office workers of Glasgow their lunch and coffee. Brian, who has had a history of alcohol addiction, has been homeless on four separate occasions and served several spells in prison, now hopes to turn his life around. He has been trained up in Social Bite’s existing St Vincent St location for the last 2 months and now plans to become a key team member in the Bothwell Street Shop. Brian said: “With my past of homelessness and prison, almost no one would have given me a chance at a job. I have been getting trained by Social Bite for the last 2 months and I can’t wait to get stuck into the challenge of working in the new Bothwell Street shop. I now go to AA meetings every week and am looking forward to building a life for myself”. Social Bite was founded young couple Josh Littlejohn (28) and Alice Thompson (24) just over 2 years ago. The couple were inspired by a visit to Bangladesh, where they met with the Nobel Peace Prize Winner Prof Muhammad Yunus and learned about his idea of a “Social Business”. Put simply a Social Business is a business that is cause driven, rather than purely profit driven. To this end, neither Josh or Alice own a single share in the business, as 100% of the shares are owned by a parent charity which distributes the profits to good causes. Importantly Sir Tom Hunter’s investment comes with no personal financial return. Sir Tom’s incentive is that he knows he is helping Social Bite to employ more people from homeless backgrounds and he is also able to choose one of the charities that Social Bite supports with its profits. Sir Tom has chosen the STV appeal. Social Bite will be making a £10,000 donation to the STV appeal bringing the total Social Bite has raised for good causes to around £25,000 since opening 2 years ago. “Josh and Alice are an inspiration and are at the forefront of the social enterprise movement in Scotland. I believe Government needs to take a long hard look at how businesses like Social Bite can be incentivised further… If you analyse the net gain to the taxpayer of taking young but ambitious people off the homelessness register and into employment surely more should be done to support them? This is a business that doesn’t compromise on quality of product or service so I’d ask everyone to give them a try and corporates to do likewise – after all what could be better; great food and giving something back!” He added. See www.social-bite.co.uk for further information.